Länk: Klicka här för att komma till Europaint. Teams composed of four riders and an alternate will have representatives compete in ​each of four classes—one rider from each team in showmanship, Western horsemanship, hunt-seat equitation and trail​—aboard ​randomly selected mounts. Good sportsmanship is an important life skill, and we will be on the hunt for the Youth World Games exhibitor who exemplifies this quality. 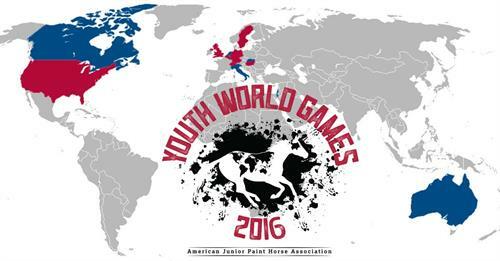 Anonymous judges from around the show will decide who receives the 2016 Youth World Games Sportsmanship Award. Exhibitor votes will be tallied and factored into the judges’ decision. The award recipient will receive a $1,000 gift certificate for a custom hat, courtesy of Shorty’s Caboy Hattery. This award will be presented to the team or country who shows the most team spirit and pride leading up to and during the Youth World Games. From cheering in the stands to sporting their countries’ flags, this honor will go to the team that has spirit and isn’t afraid to let everyone hear it! Anonymous judges from around the show will decide who receives the 2016 Youth World Games Team Spirit Award. This special award will be presented to the Paint Horse voted as the MVP of the Youth World Games by participating exhibitors. Outside of the competition, all ​Youth World Games ​exhibitors will be invited to participate in a variety of activities including day trips to surrounding areas, an AjPHA business meeting and ​Youth activities. Interested in getting involved in the 2016 Youth World Games as a sponsor or have additional questions?